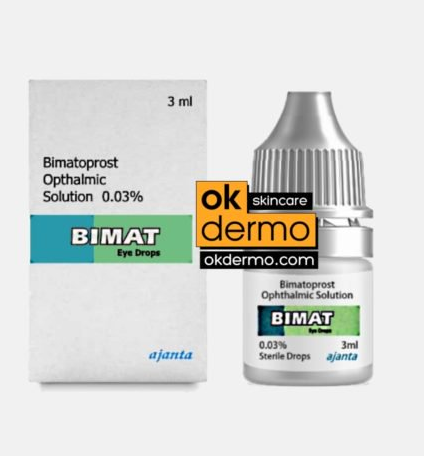 Bimat Eyelash Growth System, also called Bimatoprost, is a 3ml serum that claims to be able to help ‘regrow’ eyelashes, as well as a range of other types of facial hair (including eyebrows, hair, beard and more). The Bimat lash growth serum comes in a small tube and is applied as drops. Theoretically, all one has to do is apply these drops on a regular basis, and then they should be able to enjoy longer, lusher, and more plentiful eyelashes. To many people, this is a dream come true – thick lashes can make a huge difference to overall appearance and provide a real confidence boost. But the question is whether or not the product can really deliver on its claims. How does it work? And what results can you expect realistically? Bimat Eyelash Growth System is interesting because it is a precise analogue of another product: Latisse Lash Growth Drops. This is possible when a company doesn’t patent the ingredients in its formula. The result is that anyone can create products with the precise same composition, and simply sell them under a different name. We see this with products that package and resell paracetamol, ibuprofen, and aspirin – such as Neurofen. The savvy buyer can therefore find a cheaper alternative to a product that they rely on, without sacrificing any of the quality or the effectiveness. The active ingredient in Latisse Lash Growth Drops is the precise same as that found in Bimat Eyelash Growth System: Bimatoprost. This same ingredient is also found in many hair growth formula. It is an analog of prostaglandin, and works by encouraging the release of aqueous fluids from the eyes, while reducing pressure within them. The same substance has also been found to be effective in treating glaucomas and a range of other eye and vision related issues. Unlike many similar products, Bimatoprost 0.03 ophthalmic solution (also known as Eyelash Growth Serum) have been shown to work effectively in clinical trials. Participants that used the product found that the active ingredient – bimatoprost – could significantly increase the length of their lashes. It was therefore approved by the FDA in 2008. So, what should you expect if you start using Bimat Eyelash Growth System? While the effects won’t be immediately noticeable, you should find that after a number of days or weeks, your eyelashes begin to appear longer and fuller – especially if they have recently lost fullness. In short then, this is one of those products that ‘just works’, and it is an easy recommendation for those hoping to restore full and luscious lashes.